“Be careful, Daddy!” the little voice of my son Cade calls out from the trailer behind me interrupting my efforts at ignoring my burning legs. I am pedaling hard, laboring my bike up a 3% grade that, thanks to Cade and his twin brother Grant in the Burley Bee Double I’m pulling, feels like at least 10%. 80 pounds of toddler and trailer make for a heavy load. My legs are on fire and I’m breathing hard, but I manage a reply. “Wolves!” comes his emphatic reply. I chuckle aloud. We are riding through suburban Salt Lake City. There are no wolves—only well manicured lawns and the occasional dog on a leash. Cade is demonstrating his vivid imagination, a trait that has only recently emerged, and I’m thrilled and flattered to be included in the make-believe. “OK, we’ll be careful,” I assure him. “Let me know if you see any.” And I can’t help but let my own imagination transport us to an epic Alaskan byway with a pack of wolves running alongside us. Suddenly I’ve forgotten the burn in my legs. I look up from the pavement in front of me and take in the fine spring day. The grass has turned green, the trees are budding, and the flowers are blooming. My eyes have grown accustomed to the grays and browns of winter, and this is a feast of color everywhere I look. I am excited for our ride today. I have designed the ride over the past several nights using the BikeSLC.com cycling map and RideWithGPS.com. I was able to incorporate some new areas of the city which I have never seen before as well as some of my all time favorites such as City Creek Canyon. It was not always easy for me to amp myself up to tie an 80 pound trailer to my bike and ride further than the ice cream shop just down the street. The competitive side of me craves putting up big enough miles to make it to the top of the weekly leaderboard of the office Strava cycling club, but this is an endeavor that is clearly absurd with toddlers in tow. Aside from the obvious resistance the trailer adds, there is the effort of hooking it up, putting shoes and helmets on the two little riders, attempting to democratically settle any disputes about who sits in which seat before giving up and forcefully buckling each boy to a chorus of nearly harmonized wailing. By the time I roll out of the driveway, my heart rate is typically already at 160. Overall, Cade and Grant really do enjoy riding in their “yellow trailer”, but I’ve learned through trial and error that they have a hard stop for sitting nearly on top of each other in a confined space at the two hour mark. Any more and we enter a volatile territory which almost always ends with all three of us sick of the others. In the past, I have attempted to balance my duties as a father and a husband while ducking out during down time for solo cycling outings, which worked out well enough, while I readily admit that the existence of parental “down time” is questionable at best. 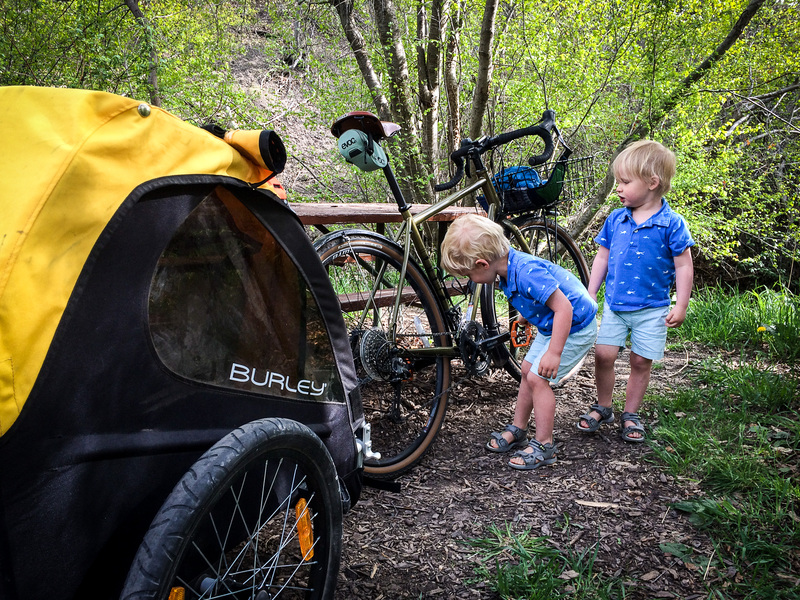 But when we added baby number three to the fold in February, I unilaterally decided it would be best for the family and our marriage if I simply took Cade and Grant with me on all of my cycling adventures leaving Tara and Harper home for some much needed peace and quiet. 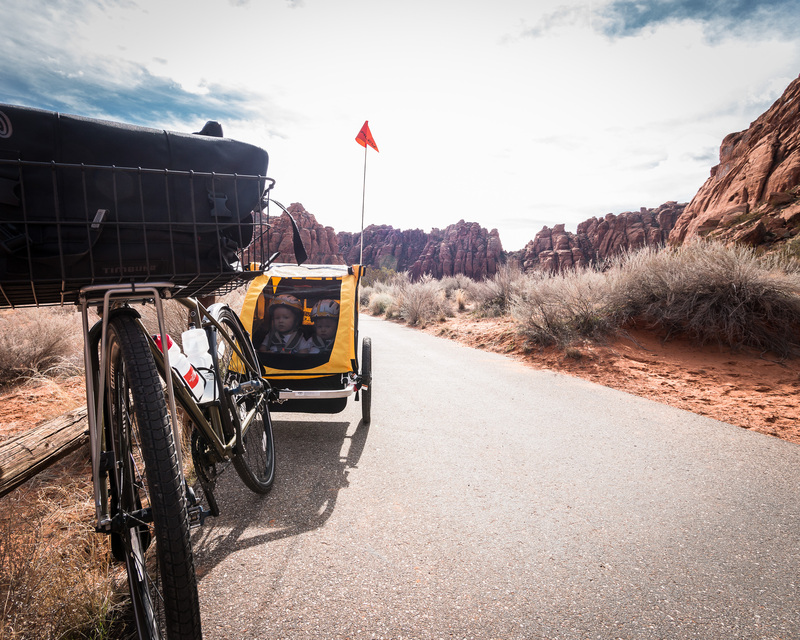 Riding with the trailer was extra work, but I told myself it increased my workout intensity making me stronger. The internal conflict came from Strava, relentlessly logging all recordable stats from my jersey pocket all the while blissfully ignorant of the 80 pound bomb I was pulling with a two hour fuse. Several times a week I would completely trash my legs with only 20 or so miles to show for it. Then one day, while ascending a bike path gently winding along roaring Big Cottonwood Creek, Grant commented on the beauty of the water, and it dawned on me: Strava, by design, encourages quantity over quality. Through its lens, an extra large fast food chain meal looks better than a tapas plate from the local joint down the street. The clever algorithms don’t care if I take the scenic route up a mountain canyon and discover a stream-fed pond rimmed with wildflowers just feet from the road. In fact, Strava actually discourages my rolling onto new roads by rewarding repetition in the form of achievements for competing against my previous attempts. An entirely fresh route typically yields a big fat ‘0’ next to the trophy symbol. I changed my outlook immediately. Strava would continue to log the numbers, but the true measure of a ride’s quality would be the photos captured and the memories created. 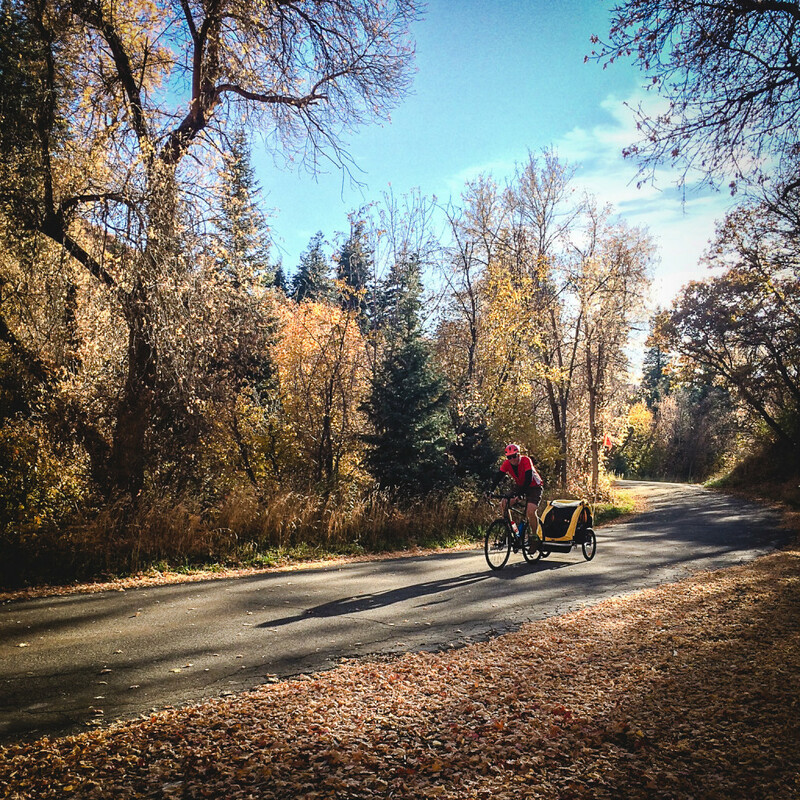 Keeping a wary eye for wolves and other beasts, I pedal up out of the city and into City Creek Canyon. The road here only allows cars on certain days and today is not one of them. We have the road to ourselves and the abrupt transition from city to peaceful wilderness is profound. As we ascend the gently sloping road, Cade and Grant have switched games. I’ve missed the theme, but evidently it is hilarious and their rolling giggles mingle with the singing birds and babbling creek. The road is lined with picnic stops and when I’ve had enough of the climb, we pull over at one. In my haste to leave the house, I’ve forgotten our snack, but a search of the back of the trailer produces two granola bars that aren’t too old. We divvy up the loot and sit at the picnic table chewing in silence as we take in the peaceful mountain setting. Grant wants to know what the creek is called. On a previous adventure, I had taught them all creeks have names. I explain to them now how snow melts from the peaks above and feeds the stream we are looking at now. I don’t know if they get it, but they listen intently with wonder nonetheless. “OK boys, you ready to go fast?” I ask them, finishing my granola bar. “YEAH!” They answer in enthusiastic unison. We mount up and cruise down the twisty canyon road. With the warm wind in my face and the satisfaction knowing my legs pulled us all the way up, a sense of euphoria comes over me. It continues as we exit the canyon in downtown Salt Lake City. There are many ways to ride through downtown and Main Street is definitely not the fastest, but I choose it today because it is my favorite. I love the narrowness of it and the way the buildings tower above on either side like an urban canyon narrows. I have to dismount and walk through Temple Square, but the tulips are in full bloom and its worth it to observe them in slow motion. The city is oddly quiet on this Sunday afternoon and it feels as though we have the whole place to ourselves. South of downtown we pick up Parleys bike path and ride it up to Sugarhouse where Tara and Harper are waiting for us at Habit Burger with hot burgers and cold milkshakes. It is the perfect conclusion to a wonderful adventure. The ride was barely 20 miles, but we rolled through the tree-lined streets and perfectly manicured lawns of some of the nicest houses in the valley, left the city and followed a mountain stream up a verdant canyon, and then soared down, gliding amongst the skyscrapers before arriving in Sugarhouse for dinner. I have seen less on 70 mile rides. The joy of designing a executing a bicycle-powered adventure such as this one is a metric Strava is not capable of measuring. But my memory is designed to record it in high definition. And the pure excitement Cade and Grant demonstrate when they see me hitching the trailer to my bike tells me they feel the same way. You’ll be smiling about 50 years from now when they are pushing you in your chair around the park on a sunny Sunday afternoon. Train them right and they’ll push you up a 3% grade, not saying a word as their legs and lungs are burning. Remember though, what goes up must come down…..
At the end of the first “Manzana Expedition” my friends and I raced to the parking lot. Years later, when I watched others doing the same thing, I slowed my pace thinking I’d rather be the last one to leave this place.